Architectural mesh can combine modern designs with functionality. HAVER & BOECKER have created a line of wire mesh that allows design professionals to transform their projects. Each mesh got its own characteristics in terms of strength, transparency, surface finish and optical effect. This results in a highly attractive material, which is adaptable to virtually any interior or exterior design application. Architectural Mesh combines outstanding functionality with high aesthetic appeal, opening up new perspectives in creative design and enabling fascinating architectural solutions. Projects can be completely transformed by the aesthetic and technical features of architectural mesh. 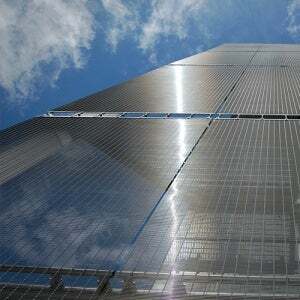 It gives buildings individual character combining light reflection and high-functional values, such as security and sun protection. With our transparent media façade IMAGIC WEAVE® offers the ability to create an interactive façade capable of effective visual communication, whilst at the same time serving as the building’s second skin. The IMAGIC WEAVE® system combines H&B Architectural Mesh with state-of-the-art LED technology and enables the creation of individually programmable lighting effects in all colours, including full video presentation. H&B Architectural Mesh offers a broad range of possibilities to realise ideas for designing facades, spaces, surfaces and other functional elements: façade and wall cladding, railings and balustrades, exhibition and shop designs, sun protection, sound absorption and acoustic systems. HAVER & BOECKER has actively influenced the technology of wire weaving since its beginning. Based on expertise and more than 125 years of successful company history, today we are able to offer our customers the benefit of our unrivalled experience, technology and knowledge about wire mesh.